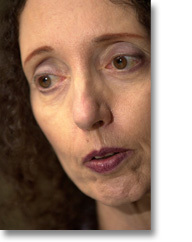 Award-winning author, Joyce Carol Oates was born in 1938 and grew up in upstate New York. While a scholarship student at Syracuse University, she won the coveted Mademoiselle fiction contest. She graduated as valedictorian, then earned an M.A. at the University of Wisconsin. In 1968, she began teaching at the University of Windsor. In 1978, she moved to New Jersey to teach creative writing at Princeton University, where she is now the Roger S. Berlind Distinguished Professor of the Humanities. A prolific writer, Joyce Carol Oates has produced some of the most controversial, and lasting, fiction of our time. Her novel, them (1969), set in racially volatile 1960s Detroit, won the 1970 National Book Award. Because it is bitter, and Because it is my heart (1990) focused on an interracial teenage romance. Black water (1992), a narrative based on the Kennedy-Chappaquiddick scandal, garnered a Pulitzer Prize nomination, and her national best seller Blonde (2000), an epic work on American icon Marilyn Monroe, became a National Book Award Finalist. Although Joyce Carol Oates has called herself, "a serious writer, as distinct from entertainers or propagandists," her novels have enthralled a wide audience, and We were the Mulvaneys (1996) earned the #1 spot on the New York Times bestseller list.